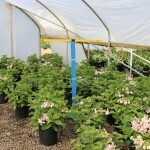 A compact shrub with lacecap double flowers that are blue or pink with white picotee edges. An elegant rebloomer, especially if spent flowers are removed, from late spring until fall. 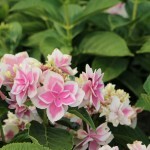 Prefers moist soil and partial shade. Mildew resistant. PP 20,998.